Capture the style of art deco in Sunrise with concrete vent blocks delivered by the friendly professionals at Atlantic Coast Precast. Since 1965, our qualified and highly experienced team has worked hard to offer a range of highly personalized vent blocks. Both functional and decorative, our team can help you choose the perfect type of block, style, color, shape, and size for your needs. We are proud to work closely with designers, engineers, architects, contractors or other industry professionals to bring their visions to life. Our Sunrise concrete vent blocks will provide shape from the sun's heat, naturally cooling your space while allowing fresh air and light to enter. Moisture will not become trapped in our two-piece functional louvers, keeping mold, damp rot, and termites away for good. Call for Atlantic Coast Precast FREE quote. 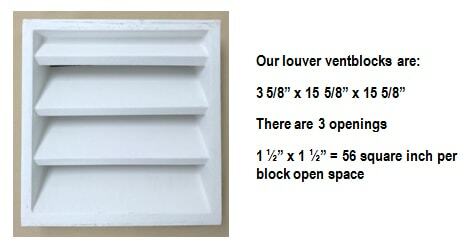 In addition to privacy in Sunrise, our concrete vent blocks can make any space feel more open, bold, and beautiful. Plus, made from precast concrete they are built to last against a variety of elements, resisting buoyancy, water, creep and shrinkage and requiring very little maintenance. Plus, precast concrete is sustainable, made from recycled materials and very often eligible for re-use and recycling once more.